Evacuated tubes and photovoltaic panels use the sun to provide hot water and electricity for home. The sum of the house’s sustainable measures contribute to an energy performance that meets and exceeds the AIA 2030 Commitment, calls for 60% reduction in energy use from regional baselines. Having earned LEED Platinum certification and achieving a Home Energy Rating System (HERS) Index score of 33, the project consumes 67% less energy than a comparable house built to conventional standards. The house’s actual EUI (calculated for 2013) is 56.9 kBtu/sf/yr including the on-site renewable energy contribution, a major improvement over the regional average of 86.0 kBtu/sf/yr for this building type. The smart building proportions and fenestration, building-integrated renewable energy production, and 100% LED lighting enable the house to reach this high level of energy performance. 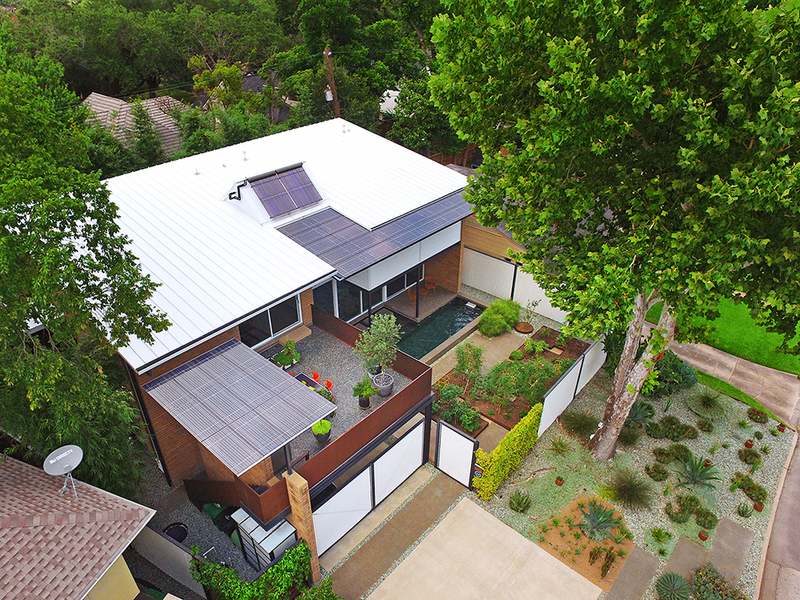 In consideration of Houston’s hot-humid climate and annual solar exposure, the house assumes a position on the site to minimize summer heat gains while allowing abundant natural light to enter. The west- and east-facing walls, built from Texas limestone, are nearly blind, a design move that has optimal thermal performance, but also creates a strong and simple textural quality in the interior. Deep roof overhangs protect the exterior sheathing and block direct solar radiation on the south-facing glazing. The north elevation is the most transparent, filling the house with light while avoiding heat gains. Thin-film photovoltaic solar panels create a generous entry porch roof cover with beautiful dappled light while generating electricity. Thin-film photovoltaic power generation is integrated into roofing system with two arrays that total 5800 kW. This solar canopy provides dappled shade for the outdoor spaces and contributes 15% of the annual energy consumption. The electrical conduit is set for an expansion of the solar panel array that would allow the house to reach net zero energy consumption. Quick charge dual electric car charging stations and bicycle storage at carport that doubles as covered entertaining space with LED wall grazers, white metal panel ceiling and Texas limestone walls..
Two electric car chargers are provided in the carport, reducing the carbon footprint of the occupant’s transportation and minimizing vehicle exhaust gas from entering the house. Domestic hot water needs and seasonal pool heating are accomplished passively thanks the roof-mounted evacuated tube solar collector. 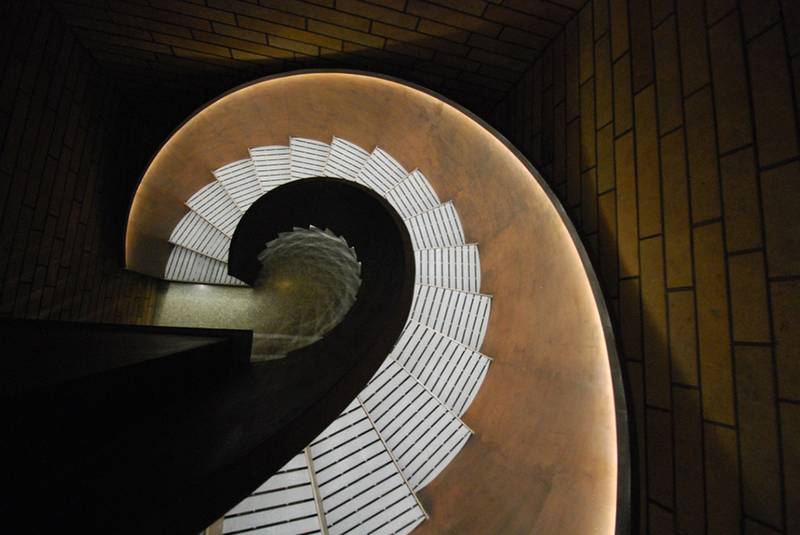 Locally crafted, sculptural rolled steel stair to basement with LED handrail light and t-bar pultruded grating stair treads made in USA. The entirety of the house’s lighting system, both indoor and outdoor, uses LED lamps. This reduces power consumption, extends the building’s electrical lifecycle, and minimizes heat gains caused by lighting. The operational life of the white LED lamps is 100,000 hours, which equates to 22 years at 50% operation. The 80% lamp efficiency achieves a high conversion of electricity to light, such that only 20% is lost as heat.